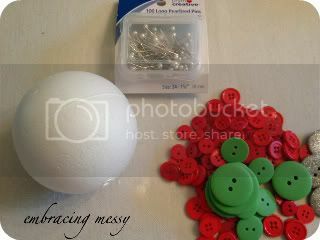 I found this idea on Pinterest, and tracked it back to this a blog by Leslie Asche found here. There was no tutorial, so I figured I'd put one together for you (not that it's that difficult, but in case you wondered). 1. Buttons, lots and lots of buttons (I ended up using way more than I expected). 2. Push pins. At least 100. 4. Jute, ribbon, string, etc. I started to type this out step-by-step, but it was insulting. Really. You guys are smart, so basically, just cover the ball by attaching buttons with the push-pins. 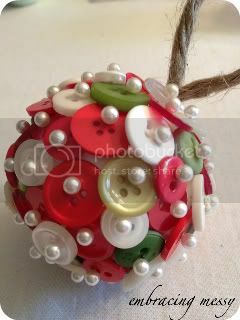 Attach some sort of ribbon, string, yarn, or twine to hang the ornament and you're finished! Love this!! 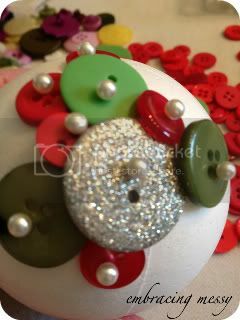 What a great way to display some fabulous buttons! 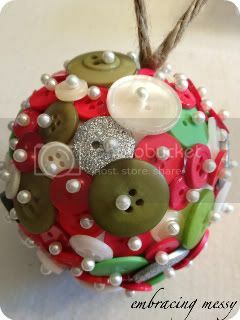 This is so pretty!I will have to gather button during the year to do this next Christmas. Please link this post to my Christmas Traditions link up in the craft section! It starts today! Hey, just wanted to let you know that I am going to be featuring this tomorrow from the Show & Share party! Thanks for linking up a great project! These are darling! Thanks for linking up to Show & Share! I’m featuring you! Feel free to come grab a button! I love this. And oh holy moley do we have a lot of buttons in my house. I may have to do this. So cute - and easy for kids to create. Thank you! Thank you for easy demo, there were no instructions on one I saw before. So easy. Thanks again.